Healthy Hair Diary: I've Been Featured!! 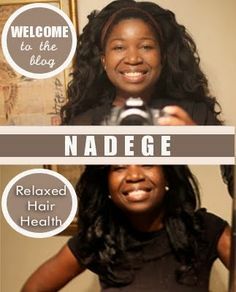 When Nadege of Relaxed Hair Health reached out to me about being featured on her blog I immediately jumped at the opportunity! This is my first hair feature so you can imagine my excitement! I am honored that she would think of little ole me, I read every-single-one of her post when I was doing research for my hair journey over three years ago, she has been an inspiration. Her blog is very resourceful and you can tell that she does her research before letting us in on her great finds. I really love her motivational and inspirational posts also, to check out my feature on Relaxed Hair Health and follow Nadege click here! Glad you made a magnificent comeback! Good for you! Congrats on the feature.